For cancellation more than 30 days before arrival, there is no penalty. 14-29 days prior to the arrival: 30 % of services ordered. 7-13 days prior to the arrival: 60 % of services ordered. 6 days/day prior to the arrival: 100 % of services ordered. credit card guarantee or 50% pre-payment upon reservation. (food, drinks, massages, transfers, tours, etc.) will be charged to the bill of the house that has to be paid at the end of the stay. Glamping Ribno Bled is situated 40 min from the national airport. Once you arrive in the center of Bled, turn left and follow the signs for Ribno and Hotel Ribno. 6 cozy Slovenian houses are nested in a superb location, not far from the greatest Slovenian jewel, Lake Bled, and in the midst of a green spruce forest and blue Sava river. Built under and in the trees, they are all made from Slovenian wood and by Slovenian craftsmen. Luxury is provided by a comfy interior, private wooden hot tub and bathroom, sauna, common area with fireplace and outdoor massage parlour with a spectacular view. Next door lies one of the prominent Slovenian hotels, Hotel Ribno, with a rich history, yet glamping guests enjoy complete privacy. Slovenian inspired dishes can appear on the guest's doorstep or can be enjoyed in the hotel restaurant. Guests of Glamping Ribno Bled can also partake in a variety of activities such as yoga, rafting, tennis, fishing, herbal and hiking tours. 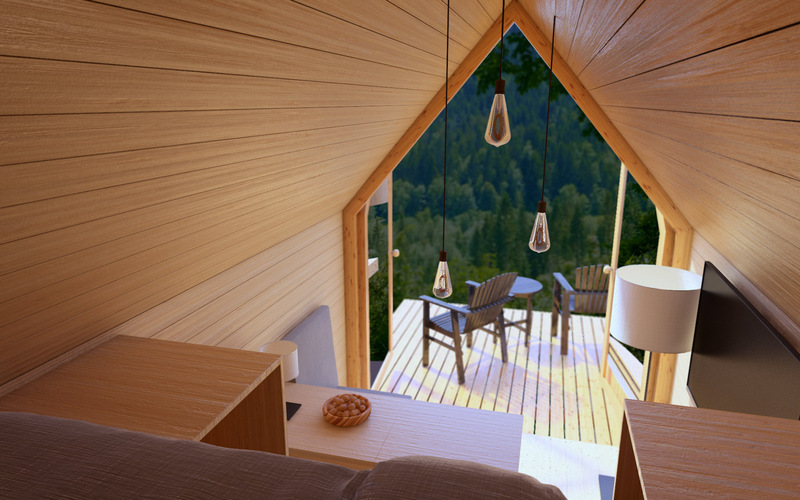 With nature at heart and guest in mind, this fresh on the scene village of tiny houses is truly a quintessential Slovenian oasis. In the Cabin one can find: 1 double bunk bed, 2 closets, A table, 4 chairs, Cable TV, Wi-fi, Infrared heating panel, Indoor and outdoor lighting. On the terrace of the houses one can find: A table, 4 folding chairs, Wooden bathtub with a lid. Additional private spaces: Private bathroom with shower, toilet and sink, separate from the house. Common areas: Fireplace, Sauna with shower, toilet and space for resting, external massage parlor, resting area with sun loungers. Use of outdoor wooden hot tub. Breakfast in the hotel restaurant, with the possibility of an upgrade for 10 Eur per person for Slovenian breakfast basket, brought to the house. Room cleaning and change of towels every 2 days.